Capital of the Austrian province of Carniola. The first mention of Jews in Laibach dates from 1213, when it is recorded that they rebuilt their synagogue much handsomer than it was before. The usual accusations against Jews in medieval times are found in connection with Laibach. In 1290 they are charged with the murder of a Christian child; in 1337 they are accused of having poisoned the wells; and in 1403 three Jews are killed in a riot, caused by the trial of a Jew who was put to death for having violated a Christian girl. The occupation of the Laibach Jews was chiefly money-lending, but they are also mentioned as merchants having an important trade with Italy, and as artisans. The Austrian law of 1244 was not valid in Carniola; and the legal status of the Jews was defined by special charters granted to individuals by the rulers. They were permitted to hold real estate, and in criminal cases were placed on an equal footing with Christians, while in civil cases they were as a rule under the "Judenrichter" of Marburg in Styria. As regards the payment of taxes they formed one body (Jüdischheit) with their coreligionists of Styria and Carinthia; but they were also required to bear their share in the city levy. The expulsion of the Jews from Styria and Carinthia (1496) did not at first affect those of Laibach, and in 1510 Emperor Maximilian decreed that they should be protected in their ancient privileges; but in 1513 he yielded to the demands of the citizens, and prohibited the Jews from engaging in mercantile pursuits. Finally, on Jan. 1, 1515, upon the petition of the citizens, they were expelled from Laibach. Occasionally Jews seem to have been in the city after that time; for in 1672 Leopold I. addressed an edict to the governor in which he ordered that no Jew should be tolerated in the province. In 1762 the governor desired to give the Jews permission to deal at wholesale in goods of domestic manufacture; but the merchants' gild objected. Joseph II., however, permitted them in 1783 to frequent the fairs. When, after the peace of Vienna (Oct. 14, 1809), Carniola became part of the French province of Illyria, Abraham Heimann of Memmelsdorf in Bavaria settled there and had to contend with the ill-will of the municipal authorities, but was protected by the French governor. Immediately after the reincorporation of the province into Austria through the peace of Paris (May 30, 1814), Heimann received an order of expulsion (Aug. 18); and although an imperial order of Dec. 6, 1817, restored his rights, he had continuously to fight the municipal and provincial authorities, who persecuted him constantly, until the events of 1848 secured him in his rights. 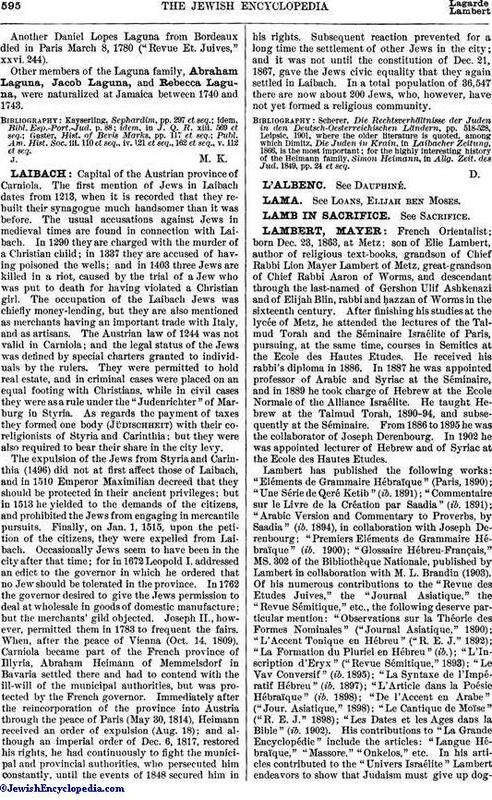 Subsequent reaction prevented for a long time the settlement of other Jews in the city; and it was not until the constitution of Dec. 21, 1867, gave the Jews civic equality that they again settled in Laibach. In a total population of 36,547 there are now about 200 Jews, who, however, have not yet formed a religious community. for the highly interesting history of the Heimann family, Simon Heimann, in Allg. Zeit. des Jud. 1849, pp. 24 et seq.